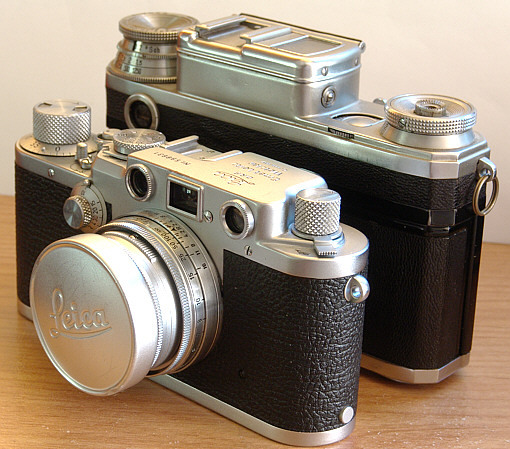 the Leica IIIF/IIIG or M2, M3 ??? dial in Minty condition !!! Because Leicas are better. Were then. Always have been. There has been a raging debate - Leica vs Contax - since they both went head to head in the early 1930's. I (and many people) am of the opinion that pre-war Contax beat the paints off of Leica. Quite simply pre-war Leica lens went from just OK to terrible (indeed except for the very late ones the case can be made that most Leitz screw mount lenses were just so so). The Zeiss Sonnar lenses in particular were faster yet used fewer air spaces that resulted in better images before lens coating - just look at the pictures with these uncoated lenses posted on this forum. The advent of coating (invented by Zeiss) closed the gap between Contax and Leica. When Leica came out with the M3 they simply blew everyone out of the water. Contax never could match the M3 body. Nevertheless the Contax rangefinder is superb and the build quality first rate and classic. Is an M3 and 1950s era Letiz lenses worth today many times the price of the Contax - only because more people will pay more; the images will be as good or better with the Contax. 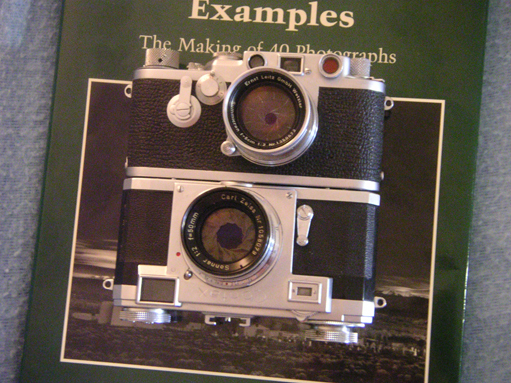 Would you choose a knob wind camera and Contax viewfinder over the M3 rapid advance lever and Leica viewfinder if you were earning a living today with a rangefinder; no but it didn't seem to hurt Capa or other great photographers who used the Contax (even HCB sometimes used Sonnars on his Leica). Contax is a great bargain but may never be the collectable investment the Leica is - or was who knows what the future holds since the company is going down the tubes and its reputation is taking a blow. are very few other things that you can buy without a mortgage that you can say that about. Leica has been firmly a collectible for some time -- if you ever visit Japan, you can see displays that are simply put obsessive. They're museum pieces that never get used, which is a real shame. Look at the Leica forum here, and there are many discussions about 2nd, 3rd and 4th generation lenses with claimed differences between them that are missed by the average hack like me. The Contax II had many advantages over the screw-mount Leicas (unified viewfinder, better lenses, easier loading, no need to trim the leader, longer rangefinder baselength, no worries about burning holes in the shutter curtain to name a few). However, the Leica is more refined. Sit a Contax II side by side with a Leica IIIf, and you'll be impressed by the fit and finish of the Leica. The small body and its collapsible Elmar or Summitar tucks neatly into the pocket of a jacket, and you can really feel the difference compared with the Contax II, which now feels big and somewhat clunky. The M is a great camera, and if you've ever held one, you can tell that it's quality through and through. It continues the precision of the screw-mount cameras with the tradeoff of a larger body. There's much debate about the Contax IIa -- whether it's an improvement over the II. It's a smaller camera, that's for sure, but you do lose some of the rangefinder baselength, and of course it won't take the prewar Biogon. The rangefinder is said to be less bulletproof than the II, although I haven't found that to be the case. That is, mine has been very reliable through heavy (not hard) use. The IIa chrome certainly is much better than the II, and the use of a nylon cord gives a lot fewer problems than the rayon (?) straps. Classic camera author Ivor Mantanle said the Contax shutter works best with constant use, and I agree with him. The postwar lenses are excellent, improving on the prewar lenses, which if in good condition (not scratched) are still world class. Carl Zeiss hasn't been the type of company to publicize minor changes to lenses. There are several versions of the Sonnar, but by and large we all lump them into four categories: prewar and postwar Jena, Zeiss-Opton and Carl Zeiss. That's about it, and even then there's not been much debate whether the Zeiss-Opton lenses out- or underperform the Carl Zeiss lenses. Some claim the East German Jena lenses are optically superior to the West German lenses. Zeiss Ikon chose not to respond to the M, instead focusing its efforts on the Contarex. Did Zeiss Ikon kill off the Contax because of the M? It probably played a role, but Zeiss Ikon's problems were many. By the way, the value in a Contax is using it and seeing the results of the excellent line of lenses. Really. (Same applies to a Leica ... and others). Easy answer: Zeiss Ikon stopped making Contaces in 1961. The pre-WWII Contax was better than the thread mount Leicas, but to sum up, per Michael Schub's post, the M3 put Leica on top of the RF market for good & deservedly so, given Zeiss Ikon's reluctance to upgrading the Contax line. Of course, it was a bit of a Pyrrhic victory for Leica as (Nikon, etc.) SLRs soon came to rule the pro/serious amateur 35mm scene. Leica has hung on long enough to dominate what's left of the pro/serious amateur RF market, which has sustained interest in the M series & its predecessors (Nikon & Canon stopped making RFs, but they @ least are still in business). AFAIK, the Carl Zeiss Foundation's resurrection of the Zeiss Ikon marque is a belated revival of the old Zeiss Ikon/Leitz rivalry. 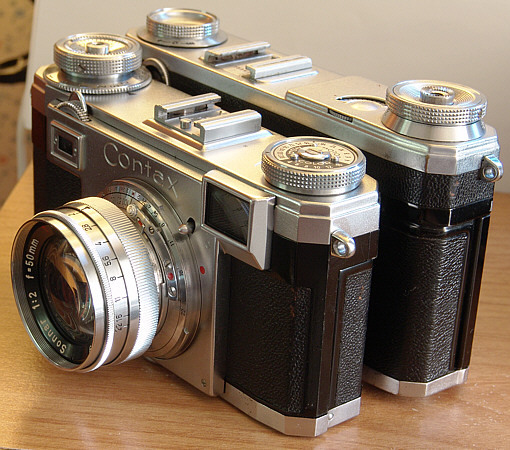 The story of the Contax IIa is an interesting one. The fact that this camera saw the light of day was quite a feat, considering the fact that a great part of Zeiss Ikon 35mm camera development was destroyed during the WWII bombing of Dresden. Leica, on the other hand, wasn't firebombed, which of course gave it an advantage when hostilities ended. Couple that with the fact that Zeiss Ikon's Jena plant and personnel were packed up and sent to the Ukraine to produce the Kiev. 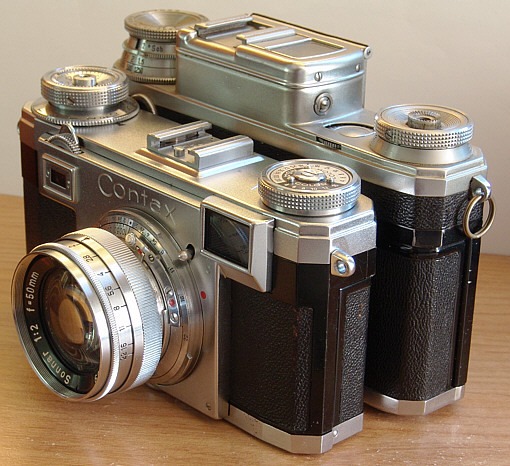 The Contax IIa wasn't introduced until 1951 -- six years after the war. Although it shares the Contax name, it's completely different -- from a mechanical standpoint -- from the Contax II. The two cameras share no parts. That is, you can't take any part from a II and put it into a IIa. In many ways, the Contax IIa (and Zeiss Ikon) could be seen as the underdog, and maybe that explains why I rather like this camera. Also, it just feels right. I like the smaller body, and I've tuned up all of my "a" models so that focusing is silky smooth. It would always be my "deserted island" camera (if you were on an island, and you could only have one camera ... that question). "The fact that this camera saw the light of day was quite a feat, considering the fact that a great part of Zeiss Ikon 35mm camera development was destroyed during the WWII bombing of Dresden." I'm not sure that's at all true. My understanding is that the Zeiss factories were very lightly damaged by bombing. However, as Dresden was clearly going to be in the Russian zone the Zeiss directors and other big wigs scrambled to get out (as rats so often do) leaving their staff to face the consequences of the Nazi adventure. The Dresden facilities were confiscated as war reparations and sent eastwards to the Ukraine as Mike said. In some ways, this was a stroke of luck for Dresden. With the old assembly lines and machinery out of the way, the remaining management cast around for a new product and out popped the Contax S, the world's first pentaprism SLR. This lead eventually to the creation of Pentacon VEB and a business which, while not as illustrious as Zeiss Ikon, was certainly highly profitable. The Praktica range of cameras sold in enormous numbers and if they weren't of Zeiss quality they certainly pleased the general public in Europe. Of course, it didn't harm that living costs in the DDR were considerably lower than in Japan, allowing the East Germans to compete viciously on price. This was just as well given the quality of some Prakticas, particularly the Nova models. In the meantime, the rats, excuse me, Zeiss directors, reformed the company in West Germany and came out with cleaned up versions of the Contax: the IIa and IIIa. 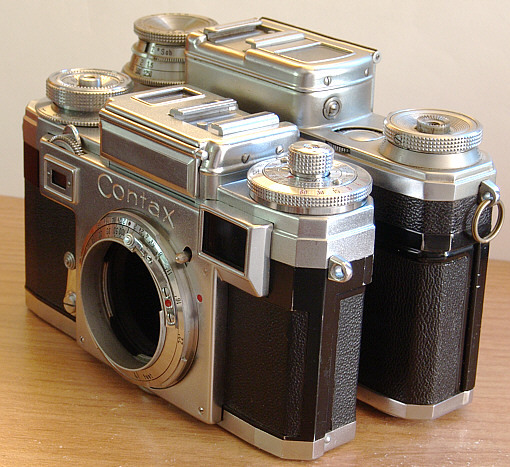 When it became obvious that no amount of legal finangling would get them the rights to the Contax S they also started development of what would become the Contaflex and Contarex ranges. The Contaflex was pretty successful until Japanese imports blew it away but the awsome Contarex was far too expensive to be anything but a niche product and sold in relatively small numbers. I have never handled a Contax IIa or IIIa "in the flesh" and didn't realise until I read this thread that there is a size difference compared to the pre-war II, III and the Kiev. Could someone please post a picture of the two side-by-side? How significant is the difference? How does the weight compare? I had a contax IIIa and have a Kiev 4. I see no significant size/weight difference. 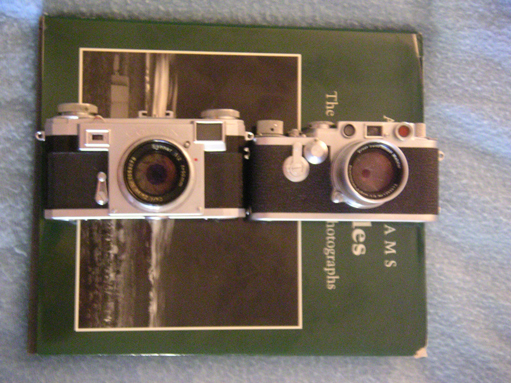 They also handle quite in the same way, except the prewar contax i.e. the kiev has the rf window in a less handy far right position. What a serious difference is in my oppinion, is the shutter. The one in the "a" series is imo much better overall. Zeiss management and scientists were deported from Jena to Heidenheim by the U.S. Army just before the town was handed over to the Soviets. Later they established a new Zeiss plant at nearby Oberkochen. This is well documented. There was no scrambling to get out at all. Some of them even went back to Jena. If you are comparing against the LTM cameras, they aren't that much more expensive and the Contax (pre or postwar) is the superior machine. 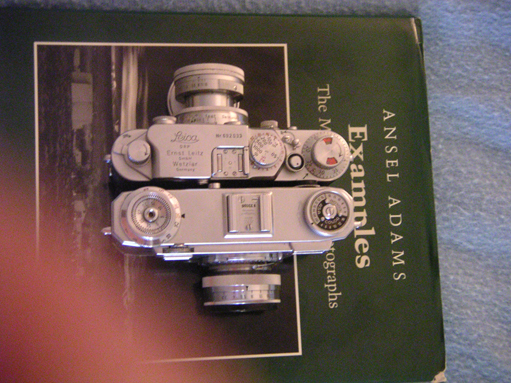 I think the IIa/IIIa would have had a better chance if they hit the shelves in '46 like the Leica IIIc. I think any difference in price is likely due to the collectable factor. Prices on Contax gear have been going up quite sharply, so hang onto that stuff. No doubt the M3 is a more advanced camera. Zeiss Ikon decided to go the SLR route and didn't bother continuing with the Contax rangefinder line. They saw the writing on the wall for the rangefinder long ago. Didn't seem to help them from going bankrupt though! A IIIA colour dial in true mint condition will fetch in excess of $500. Most go for $200-350 with or without a 50mm Sonnar. The meterless IIA cameras seem to fetch a little more. Harvey, the Zeiss Ikon camera body factory in Dresden was massively bombed in the famous Dresden raids and resulting firestorm. The lensworks in Jena made it through relatively unscathed. Even the engineering drawings inside a fireproof safe were completely obliterated! The greatest photographers that used Leica dued a very good propaganda of this camera in early days. Before that the Leica mystical qualities overspread in the mind of the people. Today Leica is more a peace of jewelry than a camera, without offense to Leica people. Today the market of rf cameras is very expensive and almost killed because this cameras are more pieces of jewlry than cameras. I'm not like this because this cameras have all conditions to compete with srl and have a lower price. Unfortunately some people like to buy a camera for $3.000, $5.000, $10.000 (body only) in a camera that is a lot more cheap than a srl in construct costs view. Yeah Gene, bright sunny day, lenscap off: my Leica MP leaves your junky '38 Contax in the duSSSSSSSSSSSSSSt. CRAP! OK, comparison time. First, IIa vs. II. IIa on the left and III on the right. Next, IIa vs. III. The III really looks huge. Contax IIIa vs. Contax III. And finally, a Leica IIIf next to the Contax III. Thanks, Mike. Gosh, those are really beautiful cameras! Here's the competition -- Contax IIa and Leica IIIf/ST. As you can see, although the Contax looks and feels much larger, they are actually almost exactly the same size, except the Contax knobs extend from the body while the Leica's are recessed. Once more, from the top. Their weights are also very close -- Leica with Summicron = 22.5 oz, Contax with f:2.0 Sonnar = 23oz. Bill, the orange RF patch is on the wrong window on your IIIf ! To those who think that the Contax was intrinsequely inferior : no it wasn't, and keep in mind that the Zeiss Ikon factory was fully destroyed by the Allied bombing over Dresden on February, 8th 1945. Hadn't it been, which company (Zeiss Ikon vs Leitz Wetzlar) would have won the commercial strike after the war ? Who can say that ? So, the facts just tell us that the IIa and IIIa are miracle cameras - the West German Zeiss Ikon (gathered in the small Stuttgart plant) successfully used Hubert Nerwin blueprints to release these cameras in the fifties. Yes indeed the M3 blew off the competition - but Leitz didn't release any RF camera with a unified RF/VF eyepiece till 1954, while the 1935 Contax II had one already... Leitz was more lucky than its great rival, and crossed the wartime better. Look at the attached picture on which you can see two Magnum foundators, two different brand cameras, two great photographers. On the Left, Robert Capa with a Contax II ; on the right, George Rodger with a Leica IIIb. Italy at war, summer of 1943. One reason the Contaxes are cheaper is that they are trickier to service well. The Leica screwmount design is a lot simpler. Harvey Platter : "My understanding is that the Zeiss factories were very lightly damaged by bombing". I've always read that the Zeiss factories in Dresden were totally destroyed by the February 13th 1945 (not the 8th I previously wrote by mistake) bombing - even the Contax II/III blueprints which were stocked on the 2nd underground level of the factory. That Allied bombing over Dresden, although not of a nuclear type, caused 135,000 dead people which is more than the US nuclear bombing over Hiroshima did. It lasted for more than 14 hours and the planes dropped "sophisticated" phosphore bombs which set the fire to the whole city, blocking the population in the cellars, where the people finally died suffering from terrible pains. The strategic importance of Dresden as a major German (thus, Nazi then) industrial plant can't be discussed but what can be discussed are the reasons the Allied had to destroy the whole city, to kill its whole civilian population, as the end of the war was very close in an otherwise already beaten Nazi Germany. Some new bombs stocks to use and experiment, probably, was the main reason the Allied had to destroy one of the most beautiful European historic cities, which had nothing to do with the Nazis when it was built up during the barocco XVIIIth century. Also, it might have been an Allied attempt to mask the fact that they had done nothing regarding the camps, although some bombings over Treblynka or Auschwitz (and the railroads that linked the camps to the rest of the Europe) could have been planned to stop the "final solution" machinery. Harvey, how can you seriously think that the Zeiss Ikon factories had been "lightly damaged" on February, 13th 1945 regarding what happened to Dresden that day, and the target the Zeiss Ikon factory was for the Allied planes ? Sorry this is OT - but let us keep the things correctly linked to the actual events regarding the two main German cameras companies of that time. Nicholas, thanks for the advice about my orange RF filters. I didn't know which to put it on so I tried both, and this seemed to work better. I think that on it's next trip to DAG it will have a new RF mirror, as it's getting pretty dim (is there a word for un-contrasty?). And it should be remembered that when Ansel Adams stooped to using 35mm, he used a Contax. 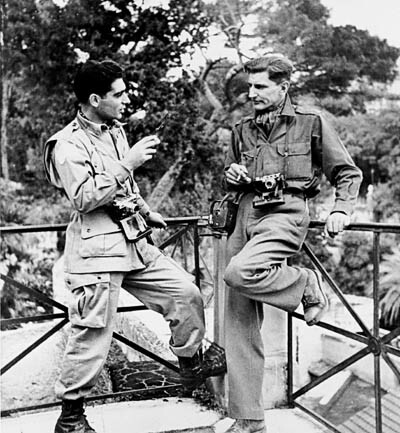 "On the Left, Robert Capa with a Contax II . . ."
Much later...one of the best threads I have ever read on PN, nice! looking and stupid and losing market share then came the Nikon (eating their lunch too) and it was quickly all over for them. Let's not excuse them completely, I think there was a lot of hubris and resistance to innovate and market effectively but this is part of longer story! The post-war Contaxes are great and still have a great following and just look a t the prices for these lenses ..oh je ! IF you have one and want a Biogon ..you might was well sell your house!